NTRUHS MBBS,BDS Management Quota Admissions 2017(NEET UG) Online Counselling: NTRUHS MBBS,BDS Management Quota Admissions 2017(NEET UG), Online application form/ NTRUHS MBBS-BDS Courses 2017 Management Quota(B Category) Admission Notification and Regulations for Online applications. 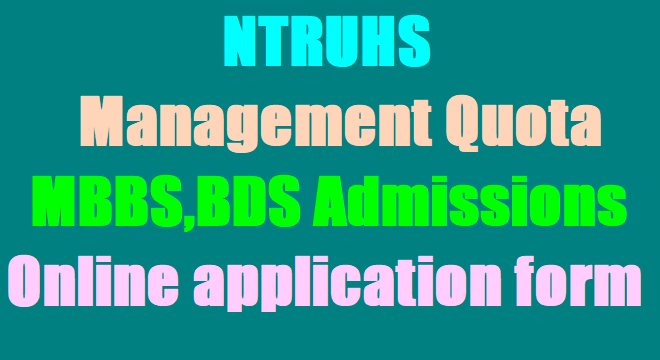 NTRUHS Management Quota MBBS,BDS Admissions 2017(NEET UG), AP NEET UG MBBS,BDS Management Quota Admissions Online application form, cutoff scores for MBBS, BDS Management Quota admissions , Eligibility, criteria for MBBS, BDS courses under Management Quota, Procedure for filling MBBS, BDS Online application and MBBS, BDS Prospectus other instructions to be available soon. Dr. NTR University of Health Sciences AP has given notification for inviting applications for Admission into Management Quota MBBS/BDS Courses 2017-18. Notification for inviting applications for Admission into Management Quota seats in MBBS/BDS Courses in Private Un-aided Non-Minority, Minority Medical and Dental Colleges and NRI Quota Seats in Sri Padmavathi Medical College for Women (under SVIMS), Tirupati in the State of Andhra Pradesh for the academic year 2017-18. Separate Online Applications are invited from Indian Citizens and Others, who have secured cut off scores and above in NEET-2017 for admission into Management Quota (Category B & C) seats in MBBS/BDS Courses in Private Un-aided Non-Minority, Minority Medical and Dental Colleges and NRI Quota Seats in Sri Padmavathi Medical College for Women in the State of Andhra Pradesh for the academic year 2017-18. The Prospectus containing the information of cut off scores, eligibility, other instructions, procedure for filling Online application etc., is available in the University website: http://ntruhs.ap.nic.in and http://appvtmedadm.apsche.ac.in (Open in Internet Explorer 11.0 Version only) . Online application form will be available from 2.00 PM on 09.07.2017 upto 5.00 PM on 19.07.2017. Note: Read the Prospectus about the eligibility for 23 NRI seats in Sri Padmavathi Medical College for Women, Tirupati. Dr. NTR UNIVERSITY OF HEALTH SCIENCES: A.P. : VIJAYAWADA – 8 Online Counseling for Admission into MBBS and BDS courses–2017-18 available under Management Quota in Private Un – Aided Non – Minority, Private Un-aided Minority Medical and Dental Colleges (under Dr. NTR UHS) and NRI Quota Seats in Sri Padmavathi Medical College for Women (under SVIMS), Tirupati in the State of Andhra Pradesh. 28-07-2017 9.00 AM 1 – 300 Dr. NTR University of Health Sciences, Vijayawada. The Candidates attending the Counseling shall pay non–refundable Counseling Fee of Rs. 5,000/- (Rupees Five thousand only) in the form of crossed Demand Draft drawn on any Nationalized Bank in favour of “Registrar, Dr. NTR University of Health Sciences” payable at Vijayawada. Medical Rs. Dental Rs. Medical Rs. Dental Rs. Note: Candidates willing to opt both MBBS / BDS Seat in Category - B are informed to bring the University Fee in the form of 2 Demand Drafts i.e. 1. For Rs. 16,000/- and 2. For Rs. 9,000/- Note: Candidates willing to opt both MBBS / BDS Seat in Category - C are informed to pay the remaining balance of University Fee of above category-B seats in the form of Demand Draft i.e., Rs.40,500/- for MBBS, 2.Rs.15,000/- for BDS. As per G.O.Ms.No.30 & 31 HM & FW., (C1) Department Dt.17-04-2015, the following is the tuition fee in respect of the Category-B & C seats in Pvt. Un-aided Non-Minority and Minority Medical and Dental Colleges. Note - 1: The Fee for Management Quota Category - C Seats (NRI Quota) for GITAM Dental College is Rs.9,92,250/- per annum. Note - 2: The candidates selected for MBBS Course in Sri Padmavathi Medical College for Women (under SVIMS), Tirupati have to pay the tuition fee at the college at the time of admission. Visit SVIMS Website: http://svimstpt.ap.nic.in for details of tuition fee and other fee particulars. Note –3: The candidates selected against Management Quota Category-C (NRI Quota) Seats shall pay the fee fixed for management Quota Category-B seat on the day of Counseling and the remaining balance amount of Tuition Fee shall be paid to the Principal of the respective college on the day of admission to the college. Note – 4: Candidates willing to opt both MBBS / BDS are informed to bring the Tuition Fee in the form of 2 Demand Drafts i.e. 1. For Rs. 3,00,000/- and 2. For Rs. 9,12,750/-. The candidates are informed to pay the remaining balance amount of tuition fee for BDS Course Under B & C Category and for MBBS course under C category at the respective college on the day of admission. The Tuition Fee has to be paid in the form of crossed Demand Draft drawn on any Nationalized Bank in favour of “The Secretary, APMDCMA” payable at Vijayawada on the day of Counseling. Note: Candidates are informed that they have to pay the college fee and university fee on the day of selection/counseling itself. If the candidate fails to pay the fee after choosing the seat, the seat will be cancelled automatically without any notice. The candidates will not be given any extension of time to pay the fee. The selected candidates shall submit one year bank guarantee for remaining period of study at the College. Certificates to be produced: The candidates are informed to attend to the counseling in person with one parent/guardian alongwith printout of application for Management Quota Seats affixing pass port size photo (similar to the photo submitted for NEET examination) and signature at the space provided. Custodian certificate will not be accepted under any circumstances. 4 Memorandum of marks of qualifying examination i.e., Intermediate or Equivalent examination (10+2). 5 Aadhar Card / Pass port in case of NRI candidate. 6 Permanent Caste Certificate, if applicable. 7 Minority Certificate issued by the concerned authority, if applicable. 8 Differently abled (PH) Certificate, if applicable. 9 Declaration (given at Annexure-1 in the Prospectus) on White Paper signed by both the candidate and NRI alongwith evidential documents such as Green Card/Citizenship Card/Bank Statements/Pass-port of the respective Country/Electricity Bill etc., if candidates opting for Management Quota Category C (NRI Quota) Seats in Un-aided Non-Minority, Minority Medical and Dental Colleges and also 15% of NRI Quota seats in Sri Padmavathi Medical College for Women (under SVIMS), Tirupati. (The declaration on Rs.10/- stamp paper is to be submitted after closure of admissions at respective college).